How do you minimize the damage from the more than 1,000 variables that affect the intended performance of every crop? Follow these top 5 factors. It is YOUR key to Protecting Product Performance. See how many you remember. 1. Soil conditions at planting. Are you willing to stop planting and wait a day or two when conditions aren’t right? (You can’t have perfect seed placement without having No.1). Are you planting your corn at 3.8 to 4.2 mph and 2 inches deep? Every top crop starts with superior seed quality. It is far more important than genetics. 4. Place the right variety in the right field. Seventy-five percent of all varieties never yield to their potential because they are planted in the wrong field. Who makes your field by variety decisions for you? What do you do AFTER the crop is planted? Remember, 75% of yield is dictated after the planter is in the shed. The last 25% is just as important. Not only are these the top 5 factors to producing a top crop, but they are also listed in order of importance. In addition, each one is affected by the one before it. For example, if you don’t have number one, good soil conditions at planting, you cannot maximize number two, proper seed placement and so on. You will also notice that early planting is not on the list. 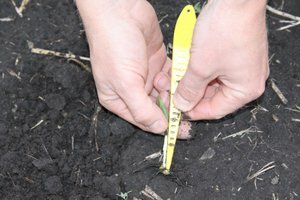 Are there benefits to planting early? Yes, when everything else is right and when your goal is to only get a 1%-5% increase in yield. But today our goal is to achieve a 20%-30% increase in yield in a single year and achieving that kind of goal has nothing to do with planting date. Instead, it has everything to do with soil conditions at planting time, regardless of the date the crop is planted. The yield of most crops is determined during the summer and the fall, not the spring. Keep that in mind when your neighbors are the first ones in the field and the first ones done planting. Remember, we harvest our crops in September, October and November, not in April or May. Follow these top 5 factors to producing a top crop and you will produce a top crop.